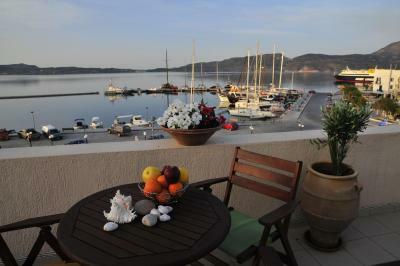 Lock in a great price for Portiani Hotel – rated 9.3 by recent guests! They accommodated me for a very late check in. It was much appreciated since the ferry got in so late! And it's so close to the port! Great room. Had all the amenities that I needed for a quick one night stay. Wish I could have stayed longer. Great location. Beautiful view of the port. Clean rooms. Friendly staff. Good breakfast spread. Great value. The location is perfect. We arrived by Ferry and it was right there. It was the perfect location and the staff was amazing. The breakfast was the best our whole trip. It was booked the other nigths we were there and we hated to leave. 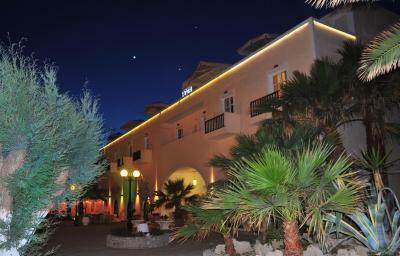 This is a beautiful hotel minutes from the Port. Perfect location. Breakfast was fabulous!! Unfortunately because of the Ferry Strike we were only able to stay one night. I wish we could have taken advantage of the beautiful balcony and view in the evening. All the people at the front desk were wonderful and did everything possible to keep us happy and comfortable. And, they did not charge us for the nights we missed because of the Ferry Strike. I would highly recommend Portiani because of location, great facilities, beautiful views and close to wonderful restaurants and shopping! 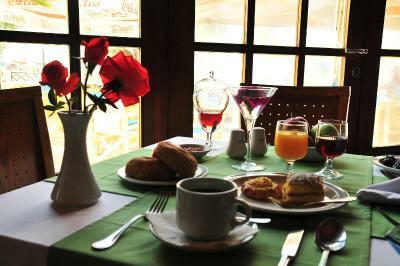 Helpful staff, excellent location and wonderful breakfast. The location of this hotel couldn't be any better, the bus station is just downstairs, the port is less than 2 mins stroll, and there is a parking really close. Stuff is very friendly, helpful and nice. Beach towels are provided daily with a bag and even a small cooler for your water bottles that was offered to us as a souvenir (how cool is that!!). 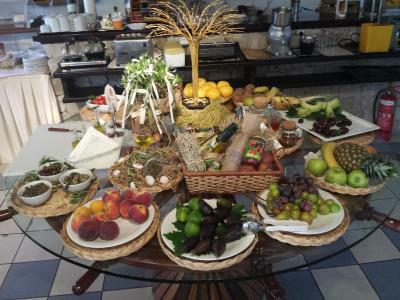 Breakfast is very rich with lots of fruits and home baked sweets. Location of this hotel could not be better. You are literally in the centre of the port restarant area and main bus stop as you walk out of the front door. The massive rooftop was beautiful to sit at at night overlooking the port. Breakfast was the best we’ve had anywhere in Europe - truly outstanding. Simple, no frills hotel right at the port with views of the marina. Great, helpful staff of women. Clean rooms, great value. Everything about this place is awesome! 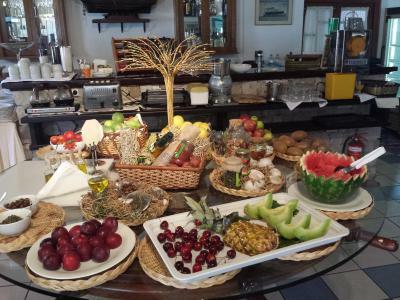 The location is perfect, the rooms are nice and big and clean... We had a sea vie room and we could see the boats coming in and out with all the tourists going on their spacial boat cruise.The staff is friendly and helpful (specially Mariana) and the breakfast.... YUMMY! 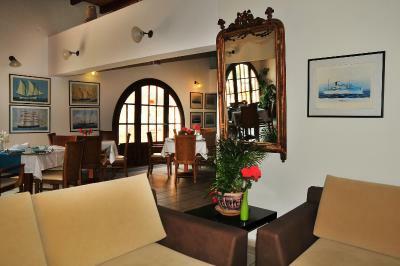 The place is amazingly located to the port and town for easy access from the airport and ferry. Restaurants and transport rentals are all within walking distance (across the street) as well as a grocery store one block away. The staff are fantastic! 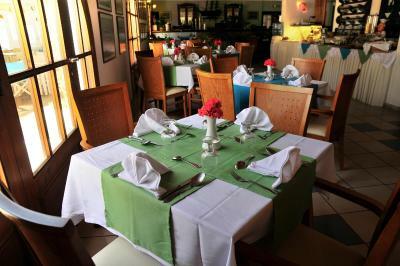 Portiani Hotel This rating is a reflection of how the property compares to the industry standard when it comes to price, facilities and services available. It's based on a self-evaluation by the property. Use this rating to help choose your stay! 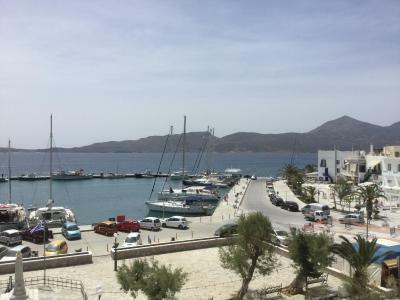 Hotel Portiani is very conveniently located in the harbor of Adamas, in the center of the town of Milos, combining easy access to the port and the beaches. Portiani Hotel provides accommodations services throughout the year, offering 17 hour reception service, travel information and daily room service. 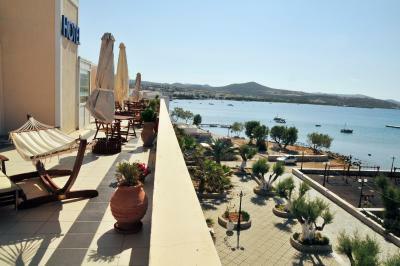 Portiani hotel in Milos is a two-story building consisting of rooms and suites. 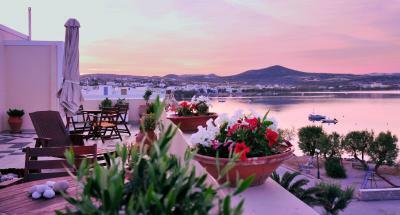 All rooms on the first floor have private balconies with a view of the Aegean Sea or the village. 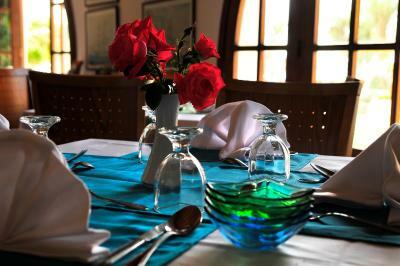 On the second floor, 8 front rooms surround a large, common veranda which enjoys unlimited views of the bay. Guests may enjoy views of the gulf of Milos, the largest Mediterranean natural port, from the spacious veranda with sea views. 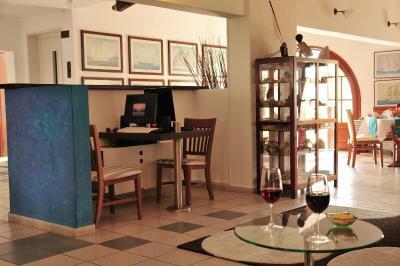 The recreational lounge is also available for use, as well as the cafe/bar and the breakfast area. A children's playground can be found 50 feet away. 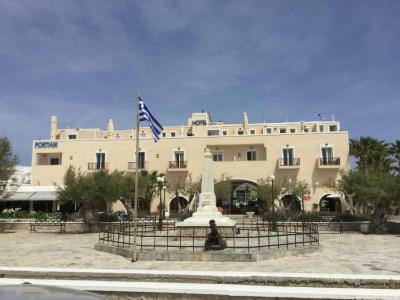 This property also has one of the top-rated locations in Adamantas! Guests are happier about it compared to other properties in the area. When would you like to stay at Portiani Hotel? 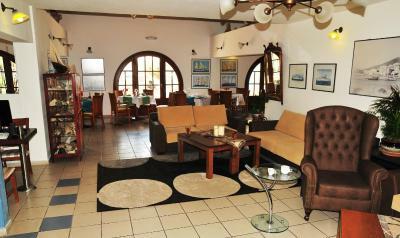 These rooms are situated on the first floor and have small private balconies with view of the village. These rooms are located on the first floor with a balcony or on second floor and open to a communal terrace with views over the bay of Milos. This twin/double room features a shared terrace overlooking the bay, air conditioning and mini-bar. This double room features a balcony, executive lounge access and electric kettle. 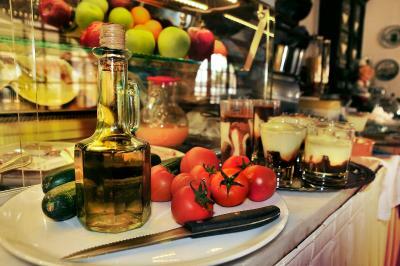 House Rules Portiani Hotel takes special requests – add in the next step! Portiani Hotel accepts these cards and reserves the right to temporarily hold an amount prior to arrival. 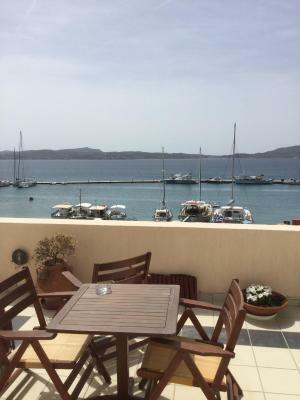 Perfect location in Adamas, right on the waterfront. Very friendly staff and amazing breakfast. 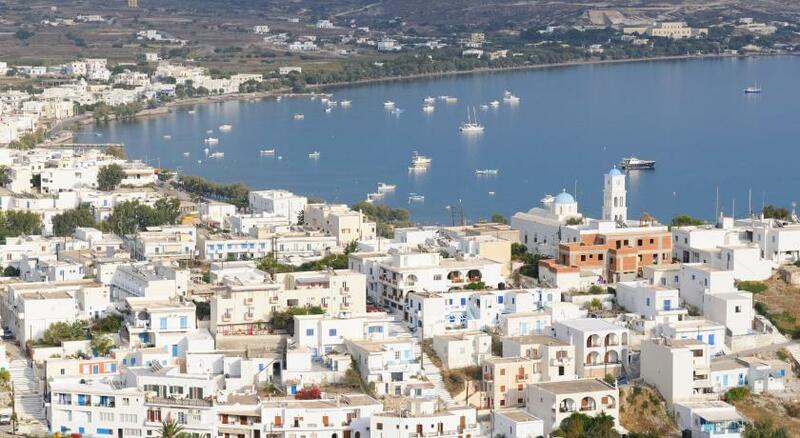 I will stay here again when on Milos. 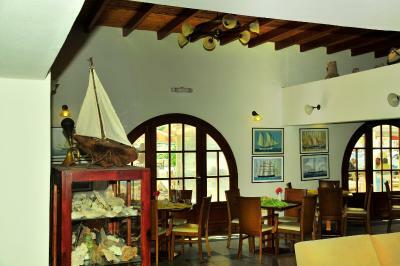 Very friendly staff, great breakfast, very well located from the port. Good breakfast, location, clean and nice staffs. That we couldn't book all our nights there. Our room was right next to the main road so you could hear everything. VERY close to the harbor. Awesome breakfast! As other travellers have commented the breakfast was fabulous. Also the location is great, right in the port near the ferry. The ladies who run the hotel are wonderful! On arrival, I asked for a room on the top with a view and she showed me 2 options and let me choose. They are super friendly and welcoming. This hotel is so central, the bus stop to all the beaches and sites is right outside and many great restaurants are on the promenade just a stones throw away. Views to die for! Also, all the boat and catamaran tours leave from the marina outside the hotel. They provide beach towels and little bags for trips to the beach at no extra cost!!! Great value for money. The staff were super helpful. This was central, so going out at night was easy.